When it comes to makeup, everyone has her own way of doing things. 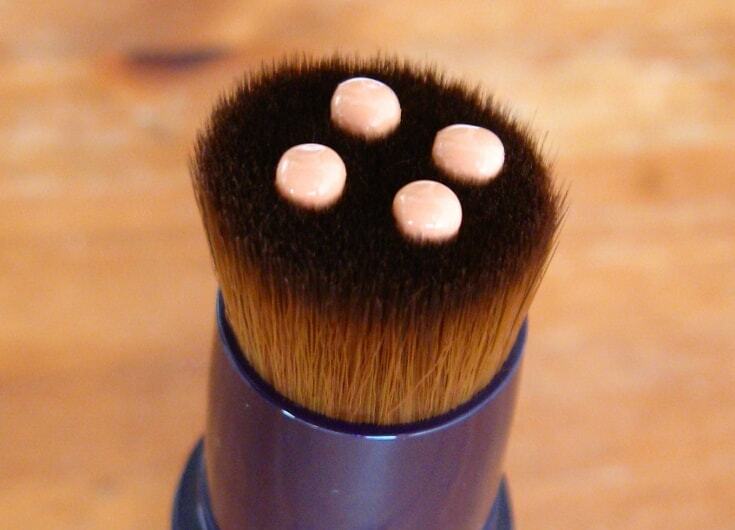 Some like to apply foundation with a sponge, while others prefer a brush. Some like nothing better than putting on a bold, red lipstick, while others prefer a natural can’t-tell-I’m-wearing-makeup look. Some happily match their eyeshadow to their eye colour (I do this ALL the time), while others would never even think of doing such a thing. I know, everyone does it. Even SAs. When I ask their help to find the right foundation shade for my pale skin, 9 times out of 10 they try to match it to my hand or wrist. And that’s so wrong, because your skin isn’t the same colour all over. So, if you match it on your wrist, you can end up with a shade that’s too light or dark for your face and makes you look like a mask! By the way, matching your foundation to your jawline isn’t much better. It works, if you like to wear turtleneck tops (or is that just me?). But, what if you wear something low cut? Much better to test foundation on your chest. That way, you can wear it with any kind of clothes and be sure your skin will be the same colour all over. It took me a while, but I’ve finally learnt that removing makeup before bed is NOT optional. If I’m really, really tired, I use cleansing wipes. I’m not a big fan of them because they don’t work as well as oil-based cleansers, but they get the job done, so are good enough on those I-can’t-wait-to-fall-asleep nights. This is another makeup crime I often used to commit before discovering the awesomeness that is Bobbi Brown Creamy Concealer Kit, which comes with its own translucent powder. Now, why do not all concealers do? It’d made setting them so much easier. That’s something that you want to do because, when concealer isn’t set, it has the annoying tendency of ending up in the little creases around our eyes, giving us a cakey, creepy appearance. A light dusting of translucent powder helps it stay put for hours, so you can go about your day without worrying about touch-ups. I could sometimes get away with this back when my skin was combination. But now, if I forget to properly moisturize my face, my foundation goes on all patchy, and emphasizes every little bit of flakiness on my skin. So not my best look, I tell you. Makeup goes on, and looks, so much better when your skin is properly hydrated, so learn from my mistake and don’t skip this step. I’m still so totally guilty of this one. These days, I seem to remember to clean brushes only when my taupe eyeshadows turns out a muddy shade of green because of the residue left on them from the day before. Ahem. That’s so bad because dirty brushes are a playground for bacteria (when they don’t ruin the pretty look you were quickly trying to create). So, let’s beat the habit together, shall we? One a week, or every 10 days tops, let=s give our brushes a good deep cleaning with water and baby shampoo. Pro tip: hold the brush bristles down, or water will end up in the ferrule, which will eventually come off. Who wants to lose a good brush that way? Let’s also start to spot clean our brushes after every use. It’s easy. Get a good brush cleanser (my favorite is from Kiko), spray it on a piece of paper, and swirl the brush onto it until the bristles are clean again. Bye bye dirt! What bad makeup habits do you need to quit? Battle Of The Bioderma Micellar Waters: Which One Should You Use?